Where in the world is Azerbaijan? | America loves Sporks! If you’ve listened to John Batchelor for a long time you’re aware of the significance in global politics of Azerbaijan and the oil and natural gas pipeline running through it. After the breakup of the Soviet Union, the fomer Republics – especially Kazahkstan were left with very large oil and natural gas deposits – but no way to export them anywhere except by going throgh Russia and giving Russia its “cut” of the profits to get the product to Western Europe and elsewhere. 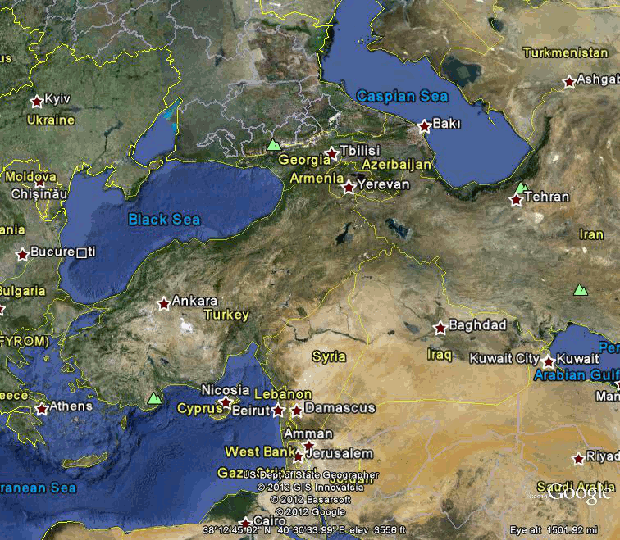 The Caspian Sea is just that – it’s a Sea with no outlet to the ocean. While the oil can be put on boats, it sill has to be offloaded somewhere else – and building a large oil tanker for an inland sea with no ocean connections is not trivial. Azerbaijan is at the friction point between Islam and Christianity – their neighbor Armenia was the target of mass killings of civilians at the hands of their Islamaic Ottomoan empire neighbors during the final days of World War I (the War to end all wars). John Batchelor travelled to Kazahkstan about a decade ago as the guest of people who support Israel – Kazahkstan was about to enter a period of great prosperity when the Baku-Tblisi-Ceyhan pipline was to be completed in 2006 and the countries had formed a strong strategic relationship. Ceyhan is on the Mediterrean in Turkey, allowing shipment of the oil without needing to pass through the Black Sea, which is militarily dominated by Russia. While there still needs to be a better way to get the oil over the Caspean Sea itself, export of oil is now a source of significant wealth in Kazahkstan. The Chinese also wanted access to this oil and gas and a pipeline was completed in 2009, which I mentioned here at the time. While the “Stans” were conquered by Islam, they are not Arabs nor are they Persians (Iranians). They do not have the same hatred for Israel as their Arab and Persian nieghbors and have been quiet allies. While 70% of the Kazakhs are followers of Islam, other religions (including Judaism) have their religions freedom protected by the government. Sources within the Obama administration have “leaked” details that Azerbaijan has quietly been working with Israel as a staging ground for potential future military confrontations with Iran. Azerbaijan is heavily dependent on oil and natural gas for its economy – both its own and the transit of oil from Kazahksan, and has a lot to gain from Iran’s oil being kept off world markets. This “news” of an alliance between Israel and Azehbeijan is not illogical. Azerbeijan is closely allied with Turkey, which has not been friendly toward Isael the past few month, partly over the development of a natural gas field near Cyprus. When the fighing starts, it helps to know who the players are and what their motives are. Wars are almost always about access to resources, and access to oil has dominated the past 100 years of war. 3 Responses to Where in the world is Azerbaijan? The obvious question that people are asking – Why are officials in the Obama administration leaking this information and why is the Washington Post printing it? Because Obama is no friend to Israel. 2) Obama is not American hence the reason he is enjoying running the U.S. into the ground. Green energy is a farce. Look at all the birds that those windmills kill. I am glad Israel is friend with Azerbaijan. I didn’t know they were not persian. Well, that part of the world has been a mixing pot. Kazahkstan wasn’t important until oil was found. The Russians pretty much sent anyone who wasn’t a Kazahk to Siberia and did some ethnic cleansing…. it wouldn’t shock me if many of those were Persians.